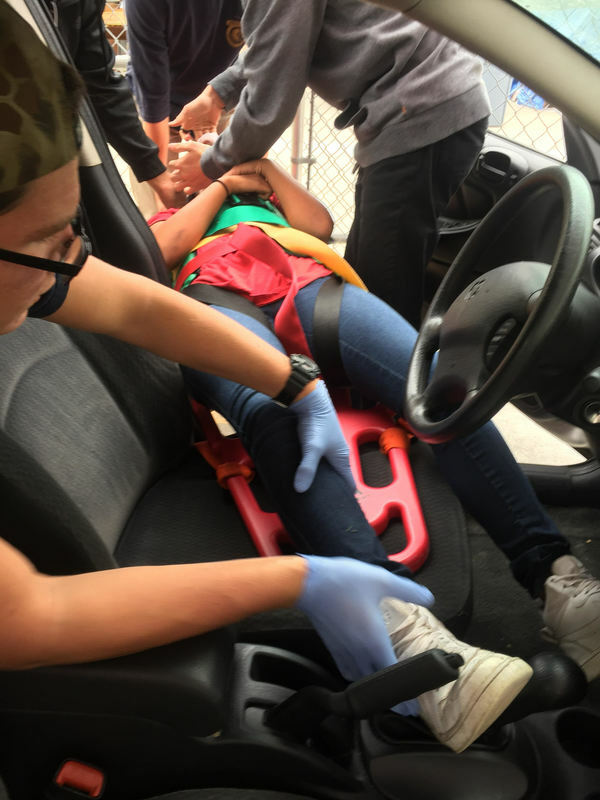 This project, "Humans of Rancho Buena Vista High School", was inspired by the work of Brandon Stanton's Humans of New York photography series. ​These stories were told with love by Mrs. Moncure's talented photography students in Digital Photo One. 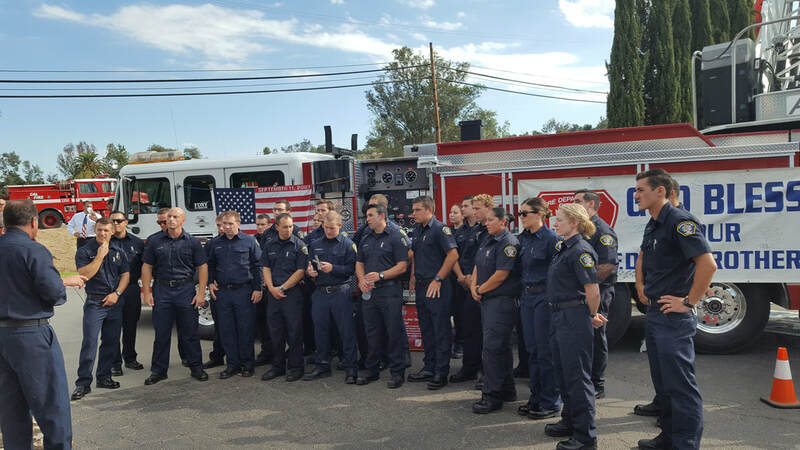 The First Responder class went to the Palomar EMT Academy and also visited Vista Fire Station #6. 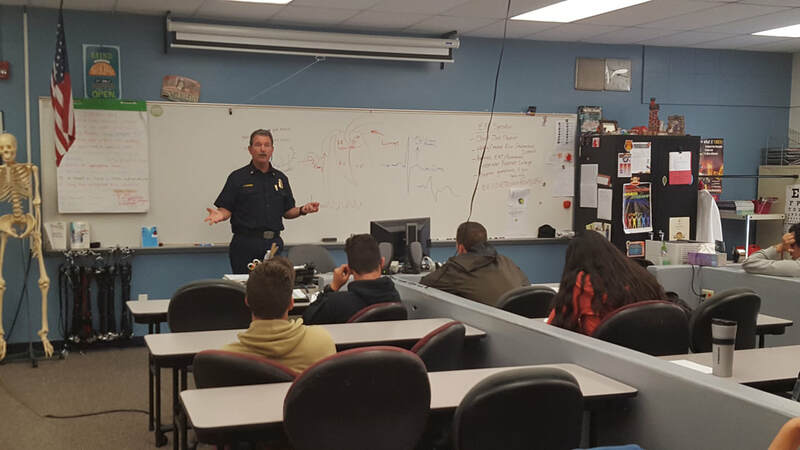 Valley Center Fire Chief, Napier, came into Martie Napier's 1st responder and pre-nursing classes to give a lecture on how to read and perform EKGs. This year was our first year competing at our region’s SkillsUSA competition. Our 3 competitors placed in the top 10 of 45! Please congratulate these students. Only the top two students advance to state but it was a great learning experience, and we are so proud of them. 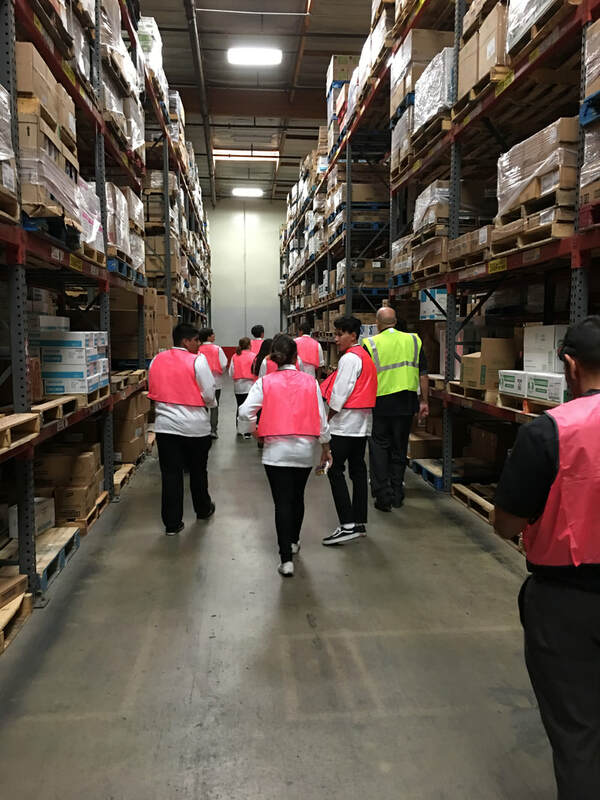 Since 1967, SkillsUSA California has provided leadership training to students and instructors in the career and technical education sectors. 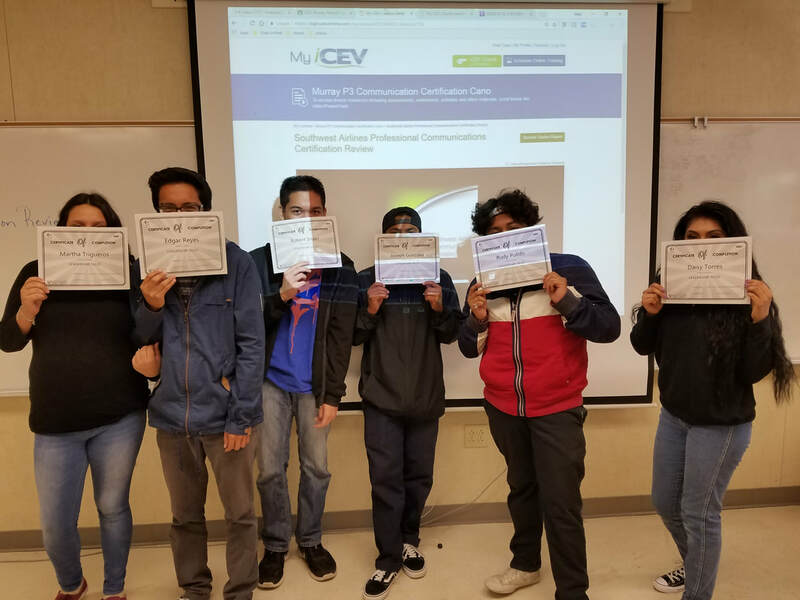 Ms. Cano's students have completed the iCEV Southwest Airlines Professional Communications Certification section! The Southwest Airlines Professional Communications Certification focuses on teaching students the communication essentials to thrive in any workplace environment. Verbal and non-verbal communication skills are explored and discussed throughout the certification, and how those skills are utilized for a positive, successful experience in the workplace is analyzed. 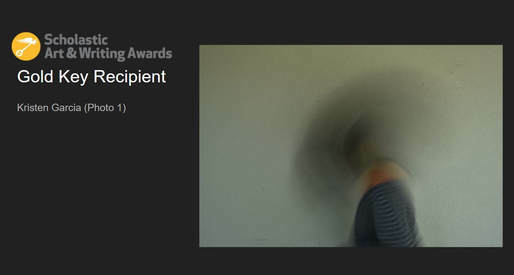 Our Photography 1 & 2 students are honored and humbled to be recognized by the Scholastic 2018 Alliance of Artist and Writers as Gold Key, Silver Key, and Honorable mention recipients in Region West. 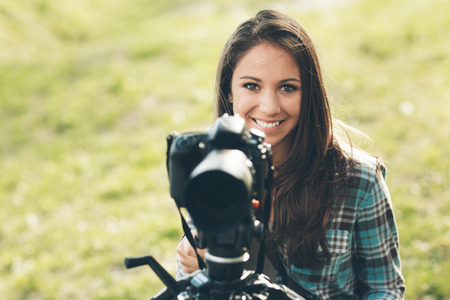 As a Gold Key winner, Kristen Garcia's work will now be judged at the national level. The Portfolio Awards are presented with scholarships of $10,000 for Gold Medal and $1,000 for Silver with Distinction Medal. We wish Kristen good luck! If you would like to help support these and future arts students, please save the date for our annual Art Expo: March 22nd 3-7pm in the Vista High School Gym. 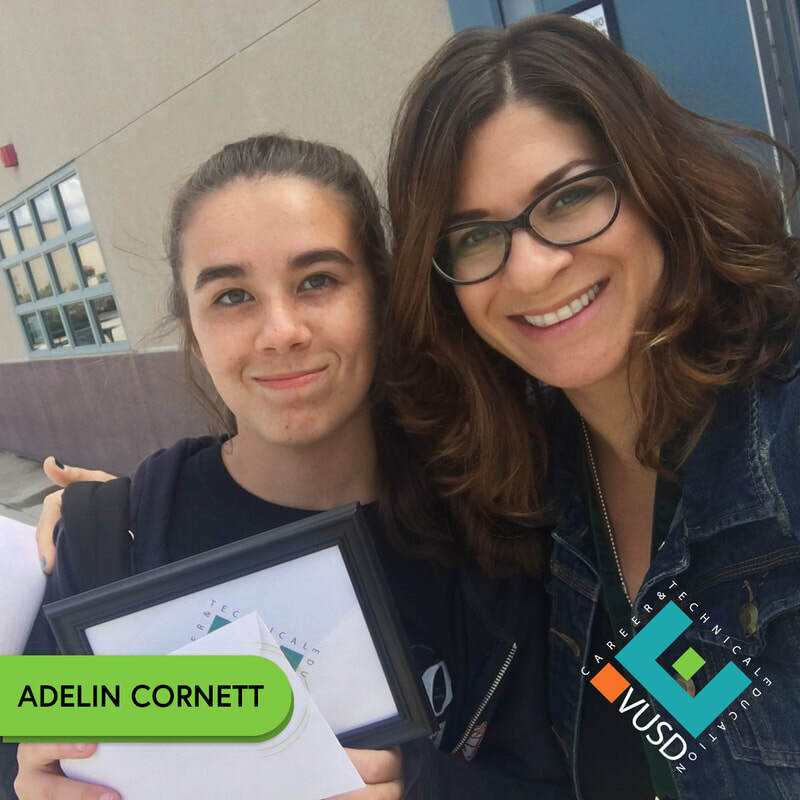 ​MVHS Freshman, Adelin Cornett, receives the top prize for the VUSD Career Technical Education Student Logo Challenge. The $250 prize was presented on behalf of VUSD and the World Wide Network of Learning. Completed during Fall 2017 in Studio903, Ms. Cornett's logo design will now be the new, official CTE logo​ for VUSD. More info on the competition can be found at www.ctevista.org. Congratulations also to Emilie Brottish and Rand Charek who placed 2nd and 3rd with their logo designs, respectively. CTE Photo Imaging Teacher, Kelly Moncure, recently took some of her top photography students on a field trip for a professional photo shoot. 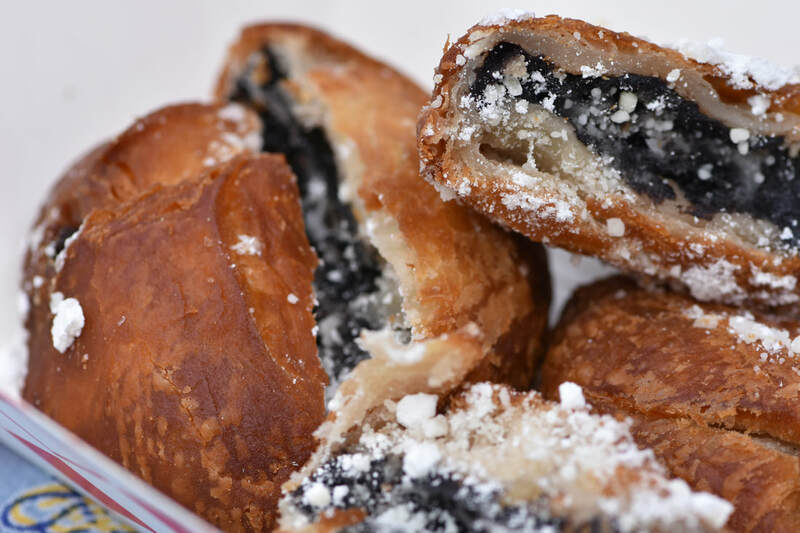 Mrs. Moncure first did a unit on food photography with her classes, where they brought in their own food. She then chose the students who did the best styling and whose photos came out the strongest to take the lead in the photographs. The day of the shoot was a blast! 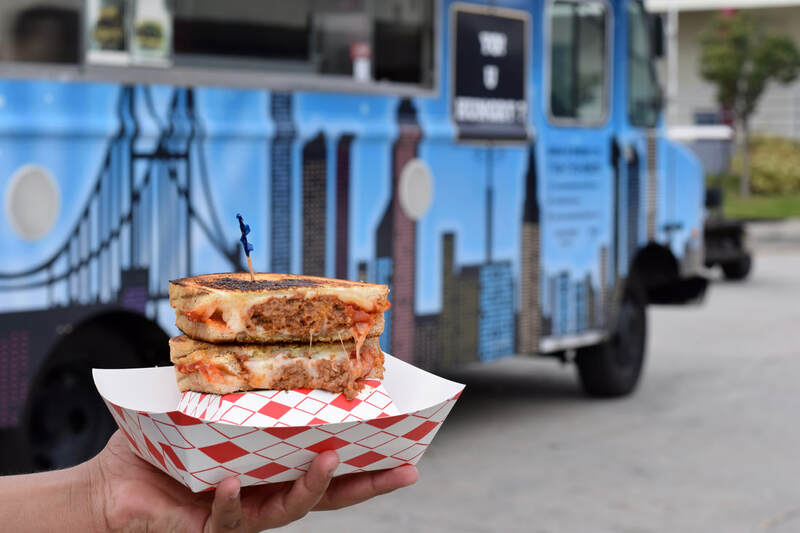 Who knew having a food truck in the quad would feel like such a festival? 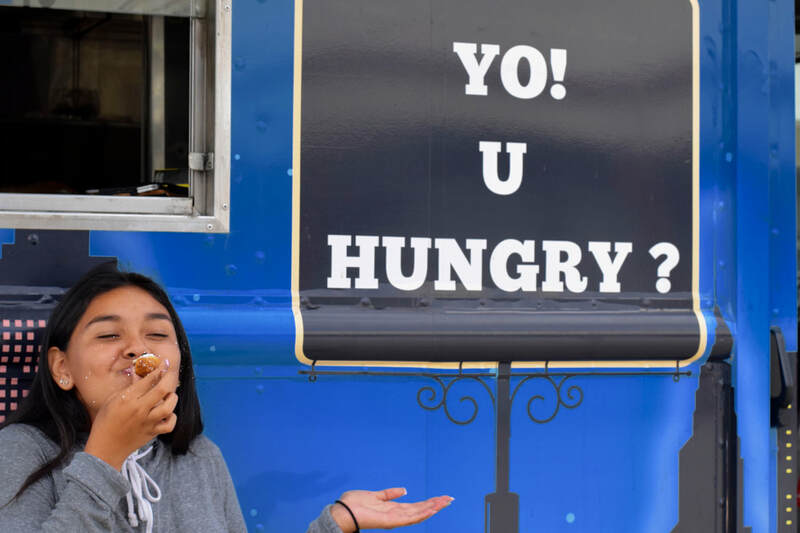 The Food Truck owner was there, he explained what he was looking for, and gave the kids a gigantic bowl of tater tots to photograph (and gorge themselves on) while they cooked the other food items. The students worked in groups of two and three, using natural light, reflectors and the f/1.8 50 mm lenses. They used an assortment of tablecloths and props that students brought in and also had a white light tent. 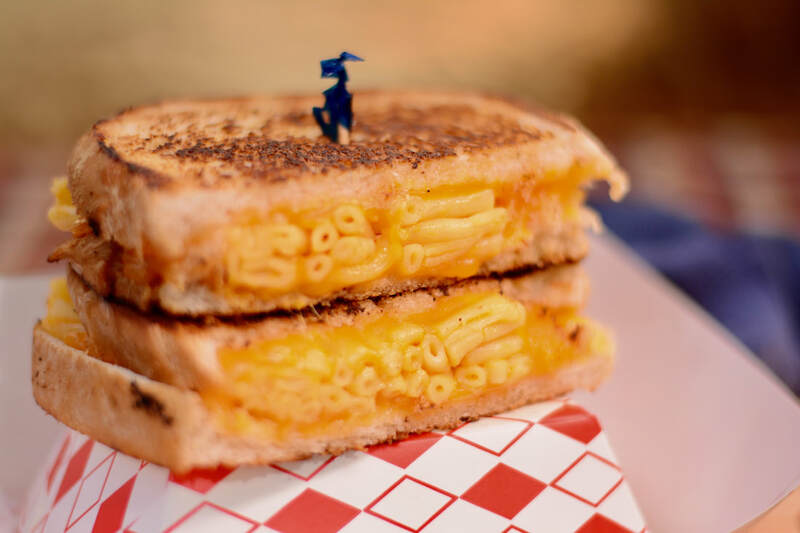 The owners would send out a food item, and the kids would take the lead to photograph it, style it, and figure out how to best showcase it. He was so happy to help the community, and said he wished that he had something like that when he was in high school. The best photographs were then sent to him for him to choose from. 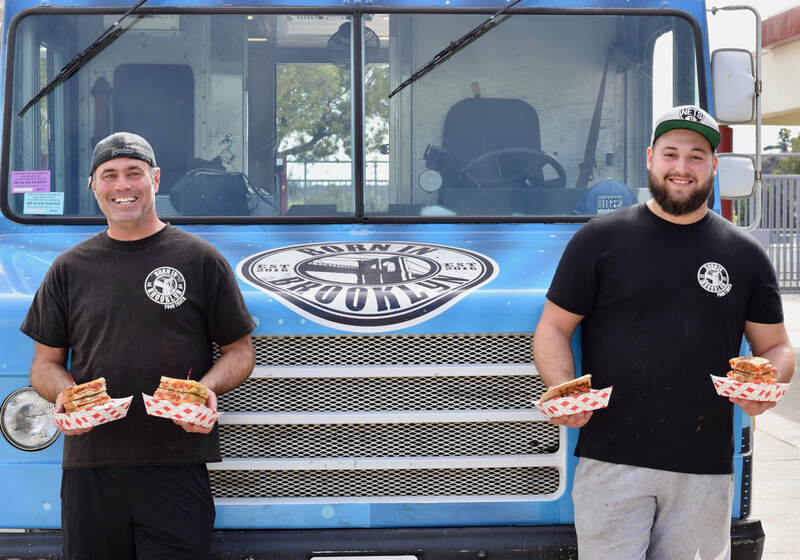 He worked with a vendor to print and laminate the photos, and put on the side of his truck with the name of the food item. He was absolutely delighted about the quality of the work and to be able to showcase the students' phenomenal photography skills. It was such a great thing for them to work a professional job as barter- they couldn't believe it- and it give them firsthand experience about what it is to do a job. 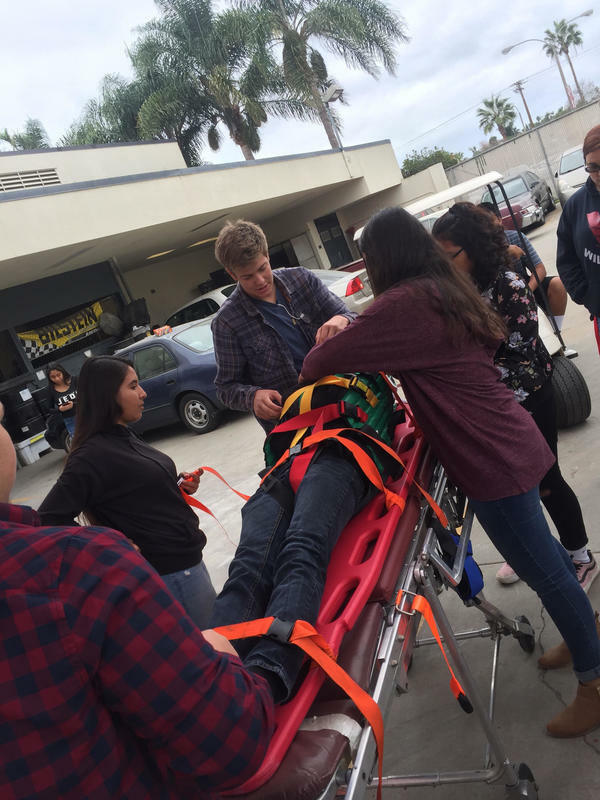 Mrs. Napier's medical classes participated in the "Holiday for Heroes" this year. 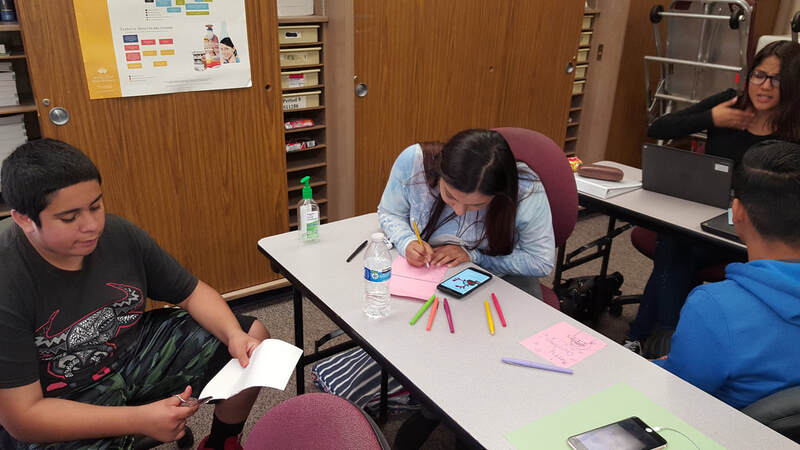 They made cards and mailed them to the San Diego Red Cross, where they will be mailed to recovering soldiers and those abroad. The students were very excited to be able to do this for our soldiers, local and deployed. Today's field trip was a great day for the students. 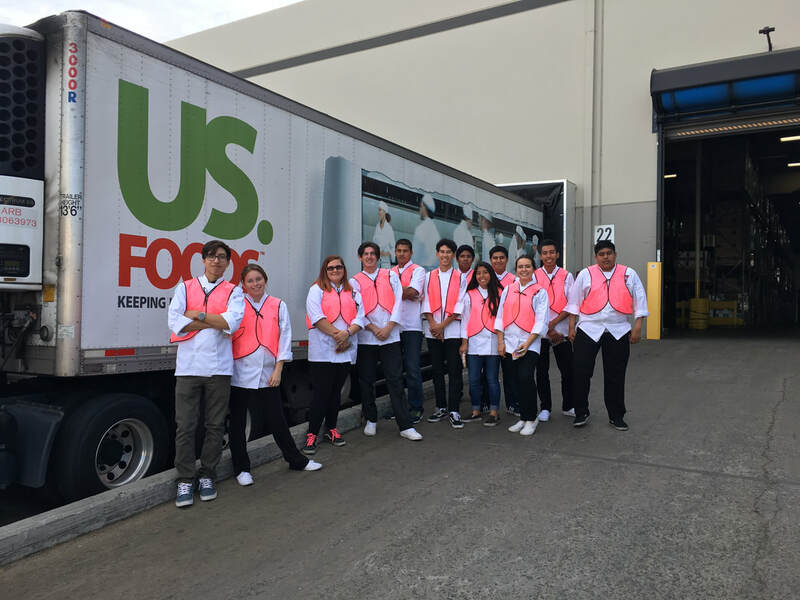 Their eyes were open wide to opportunities in the Foodservice and Hospitality industry. The students were given job applications to apply for a job at Beach Plum and Tin Leaf Fresh Kitchen. The students understood the importance of a first impression and how it all ties together with networking. 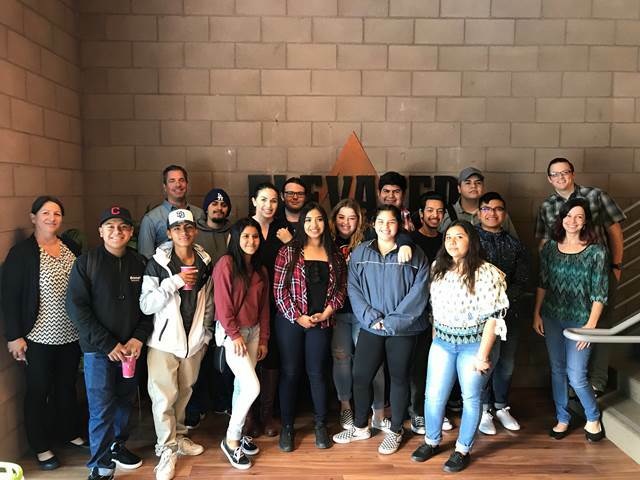 On November 7th Mrs. Cano's Business and Finance students took a field trip over to Elevated in Carlsbad to shadow the company for the day. 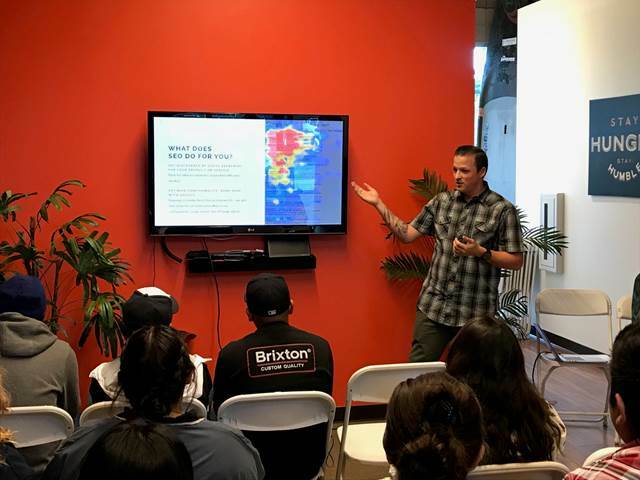 The students learned about online marketing and how companies track their customers and where they click on websites so the business can improve their sales. 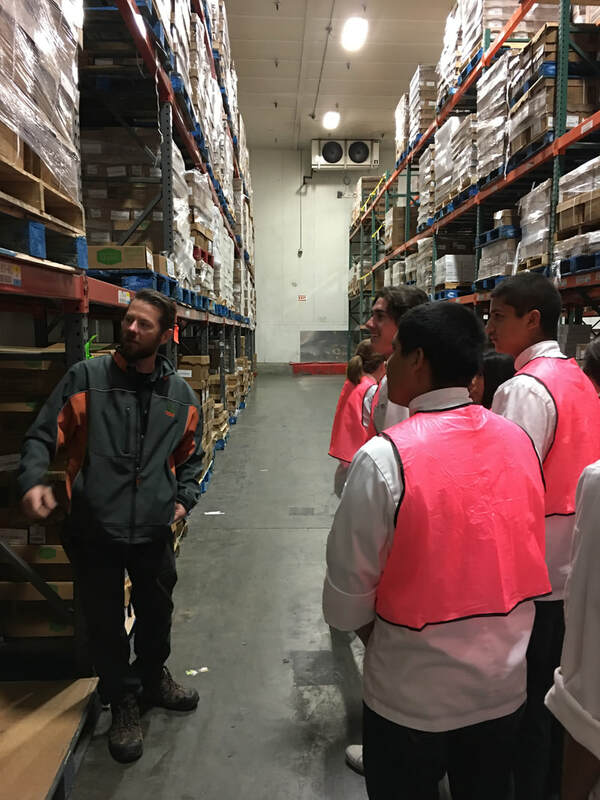 There was also a tour of the business and the company had students go through a website scenario and answer a questionnaire. The company also provided many resources to students on educational pathways and internship possibilities. It was a great and engaging experience overall for the students! Three Mission Vista High School students recently participated in the Augmented and Virtual Reality Festival at the Reuben H Fleet Science Center. The students, Cole P, Joseph M, and Blake V, created their VR game specifically for the event and presented their game to visitors of the Fleet Science Center. 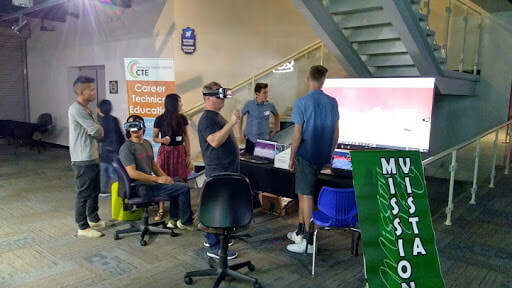 The MVHS Computer Science students were invited to exhibit at the VR Festival because of their previous success of hosting the Genius in the House event at the Fleet Science Center earlier in the school year. ​Cole, Joseph, and Blake collaborated on an outer space VR game that took them three weeks to complete. The students used the skills they learned in their Computer Game Programming class and worked as a team to create the amazing game. 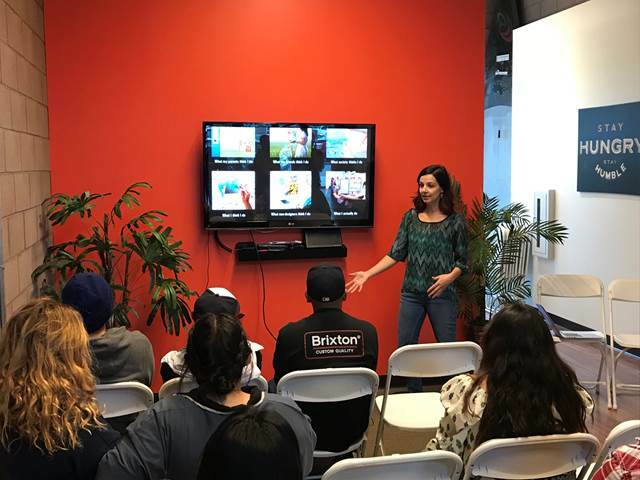 They had not worked with Virtual Reality prior to creating this game and had to learn the intricacies of Google VR for Unity and Android App development. 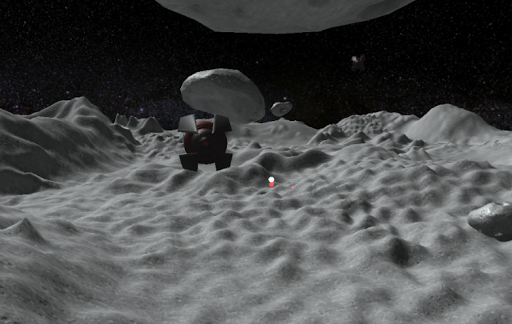 The VR game put the player in an immersive outer space setting where the player had to dodge asteroids and shoot at alien spaceships. Joseph and Blake, who also participated in the Genius in the House event, asserted that the AR and VR Festival went even better than the Genius in the House event. The Fleet Science Center guests were very excited to put on the VR headsets and try out the students' game. It was surprising to find out that most of the visitors had never experienced VR and they all enjoyed the immersive experience. Many of the children and even some of the grown men didn't want to take the headset off and a few of the guests even came back to play the game a second time. The students enjoyed talking about VR game programming and were pleased to introduce VR to so many of the Fleet Science Center guests. 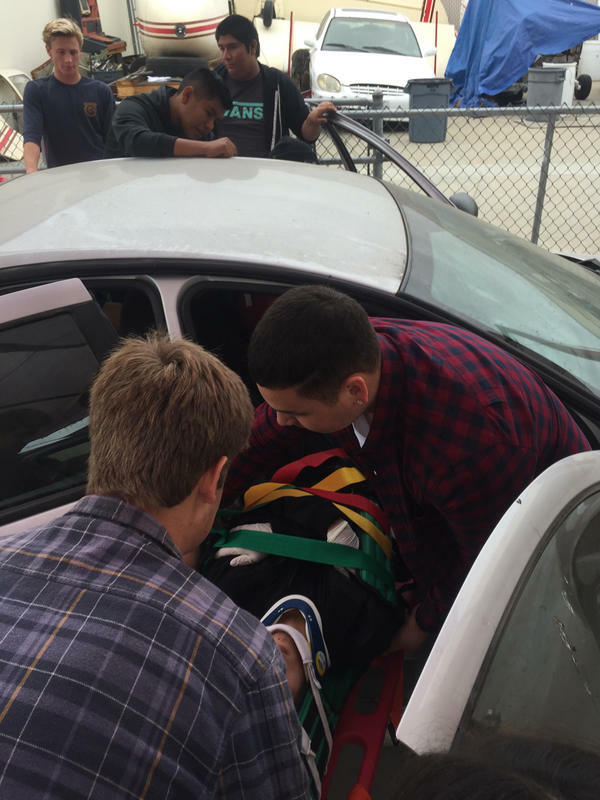 Mrs. Napier had 26 first-responder students participate in real-life scenarios today, 10/30/17, during 3rd period. 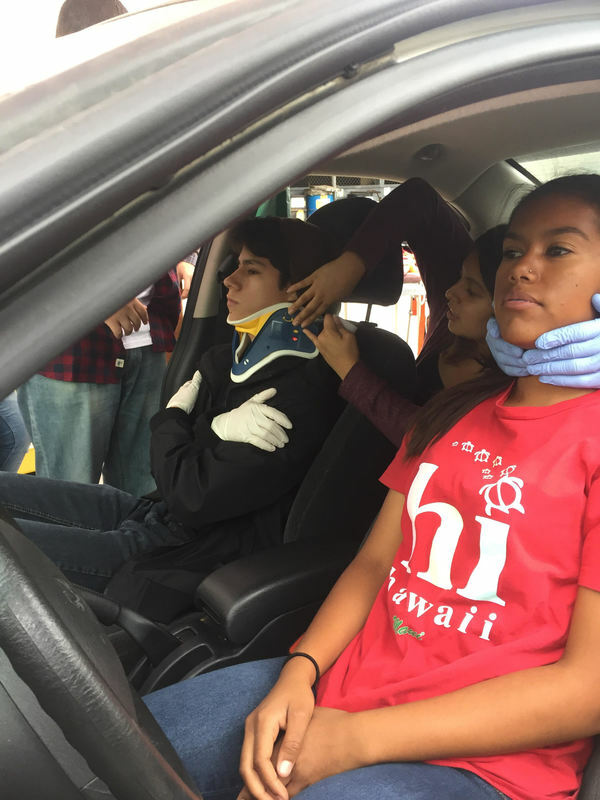 Students learned to communicate professionally and use team work to keep themselves and their patients safe. A big thank you to Mr. McCreary here at Vista High School, for allowing us to use vehicles in his auto bay. 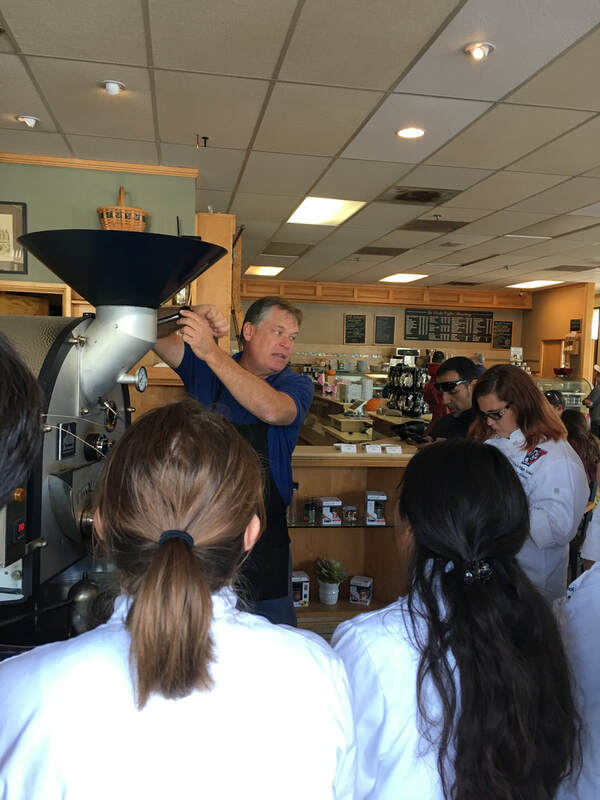 The Panther Café opened on Thursday to a full house and many orders to deliver and began the 7th year of a highly successful and popular program for students at Vista High School. 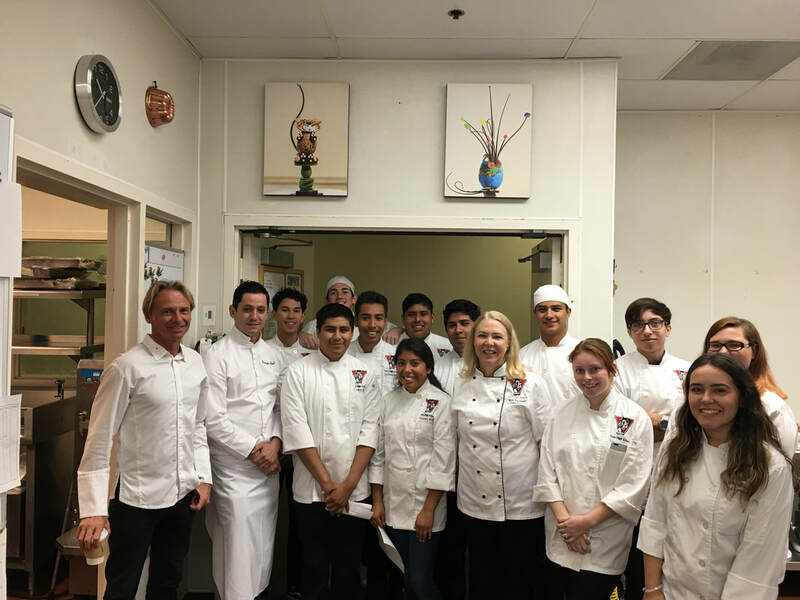 Chef Kim Plunkett is in charge of five classes of students, grades 10-12, each day, 25 students in each class, who learn the skills of culinary creations and all of the workings of a large scale kitchen. 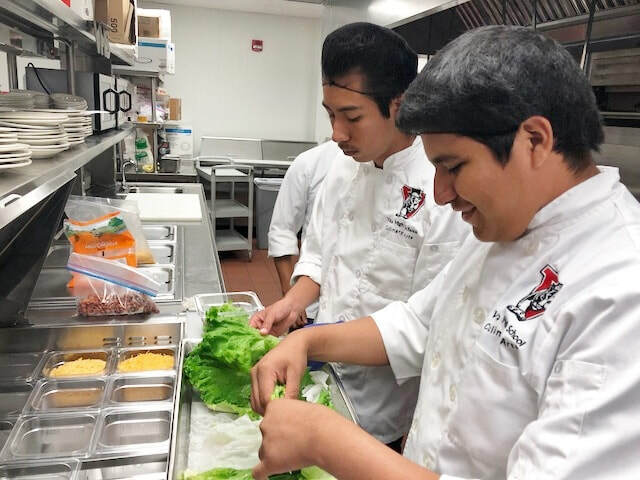 ​Twice each month of school, beginning in October, the students in her Culinary 1 and 2 classes, use what they have learned to prepare lunchtime meals for teachers and other guests who have signed up during the prior week. 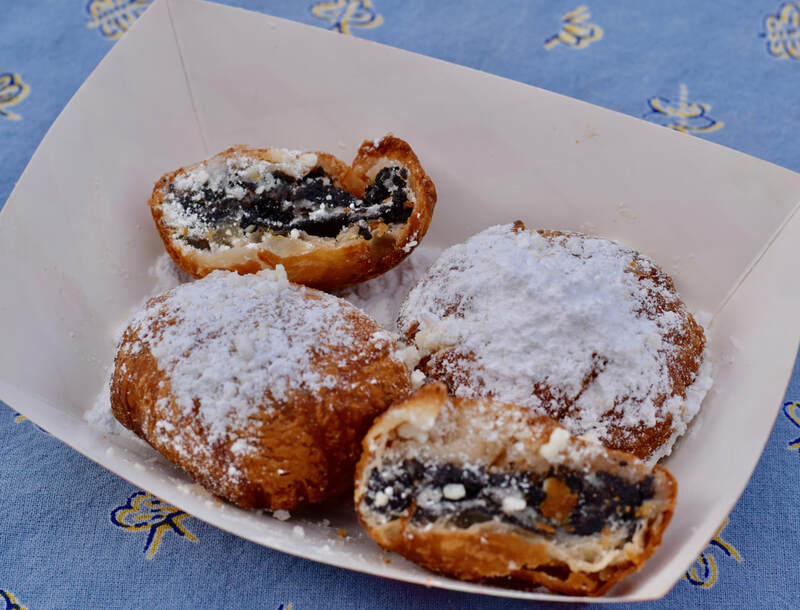 The first lunchtime meal for this school year featured a choice of Guy Fieri’s Loaded Baked Potato Soup or savory Roasted Butternut Soup topped with homemade crème fraiche, incredible Applewood Smoked Bacon Sandwiches, and apple dumplings with homemade vanilla Gelato for dessert. The potato soup was rich, creamy and delicious. I also tried a taste of the butternut soup and it was incredible. THE BLT’S WERE UNIQUE. 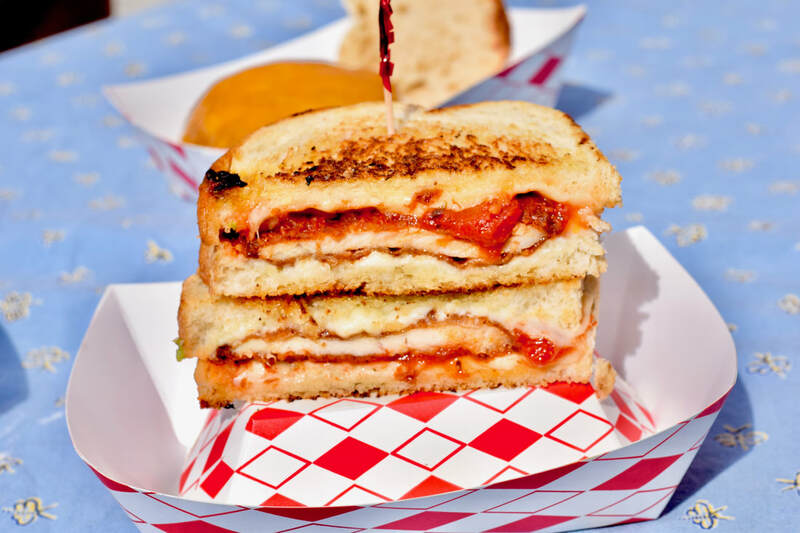 THE BACON WAS WOVEN IN STRIPS SO IT WOULDN’T SLIP OFF OF THE SANDWICH, A TASTY SPREAD ON THE BREAD AND THE TOMATOES WERE THICK AND JUICY WITH ROMAINE LETTUCE RESULTING IN A WONDERFUL BLT. 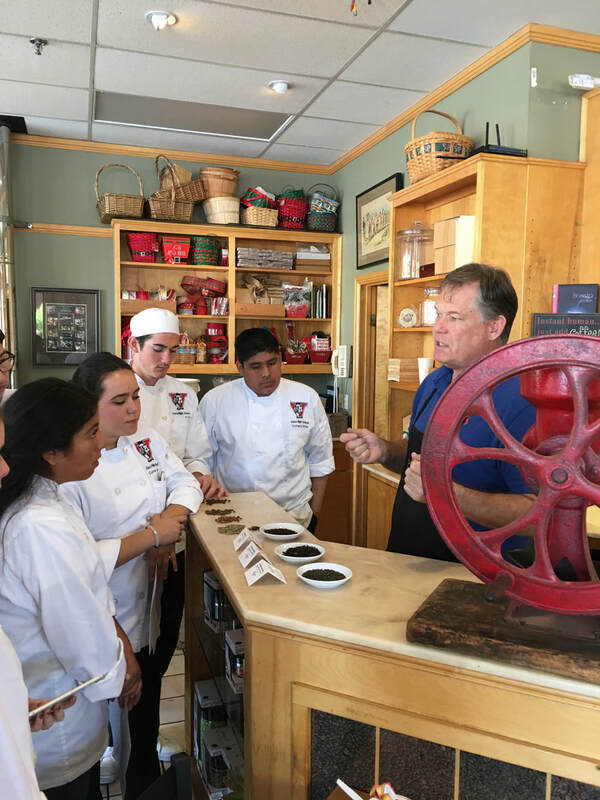 The Culinary program also has their own Gelato machine which made the vanilla Gelato very thick and creamy and a wonderful complement to the warm apple dumpling. A little bird said the next lunchtime meal may feature a prime rib dipped sandwich. 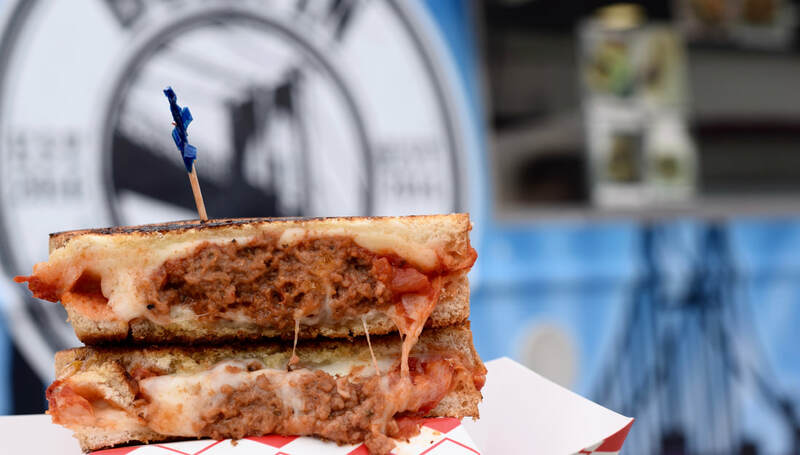 It is the best $10 you will spend on a lunch. Arriving early before the luncheon began, we witnessed a busy kitchen, students in white chef’s coats, hairnets, long pants, some students in chef’s hats and all of them busily working in assigned jobs for the luncheon. Some of the meal was prepared, such as the gelato and the bacon woven by Culinary 1 students the day before. ​Adylene Mancilla was busy stirring the potato soup as it warmed on the large industrial stoves. Marcelo Lopez and several others were carefully monitoring the toasting of the bread for the sandwiches. 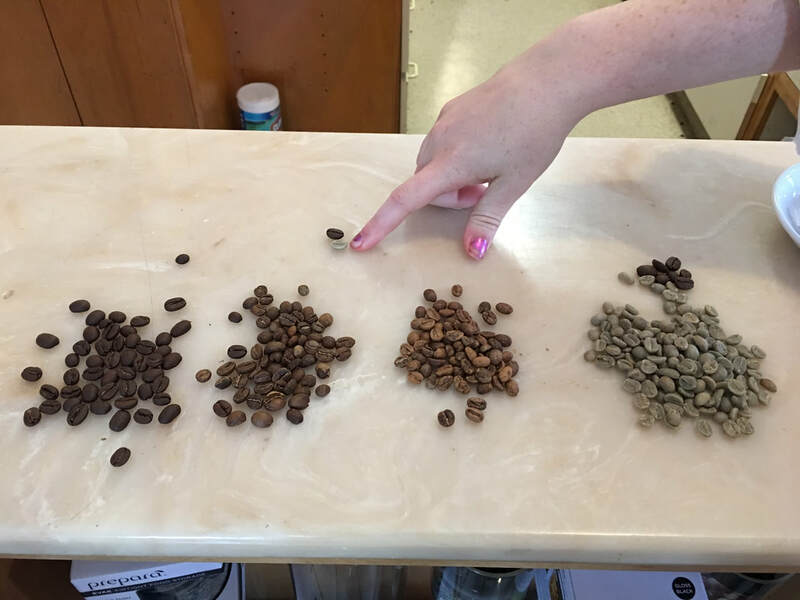 It was a hive of activity as students sliced tomatoes, peeled lettuce, began to put the large trays of bacon in the broilers, added finishing touches to the butternut soup and put the final touches to the café place settings. FOR THE LUNCHEON, 18 STUDENTS WOULD WORK AS LINE COOKS, SERVERS, AND DELIVERER’S OF PRE-ORDERED LUNCHEONS. At each luncheon, 8 tables in the café, seating 28 visitors and 5 tables outside, seating 14, are available. For today’s luncheon there were 19 pre-orders that would be delivered directly to the teacher or staff member ordering a lunch. Sharply at 11:40, students assigned with deliveries lined up to begin taking meals out to those who had pre-purchased. For today’s luncheon, beginning at 11:45, Hailey Santana served as the maitre d'/receptionist checking in the luncheon attendees. Guests were told of today’s lunch menu and escorted to tables. The student servers were efficient, taking our orders and bringing our meals and drink orders. 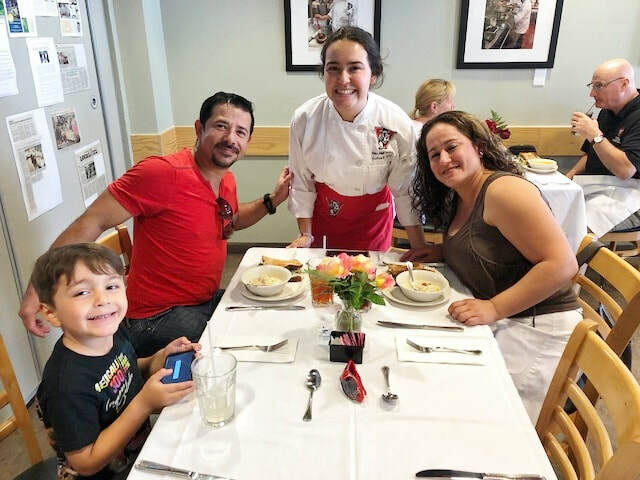 Our server was Karla Cruz, a Culinary 1 Junior, with an extremely outgoing and friendly attitude toward her job. Those eating in the Panther Café today included parents, former students, former teachers, current teachers and invited guests. NEEDLESS TO SAY, THE SERVICE WAS AMAZING, THE FOOD AMAZING AND THE OPPORTUNITY PROVIDED FOR THESE STUDENTS TO LEARN A USEFUL SKILL THAT THEY CAN DEVELOP INTO A LIFELONG JOB SKILL IS ASTONISHING. The program Chef Kim has developed for the past 6 years has grown into one of the most outstanding culinary programs in the county. Using the ProStart Curriculum, students go through a 2 year pathway in Culinary 1 and 2. Students meet 2-3 times a week in the classroom and the rest of the time is spent in the kitchen. She said the one hour class time this year hurts lab classes. The school was on a 2 hour block schedule last year. Topics covered include an introduction to culinary arts, food safety, workplace safety, professionalism in the workplace, stocks, sauces and soups, fruits and vegetables, potatoes and grains, meats, cooking terms, knife skills for the kitchen, kitchen equipment, management essentials, careers in food service, and techniques for serving. She will also cover, in the classroom and kitchen for year 2 students, breakfast food and sandwiches, nutrition, controlling food service costs, salads and garnishing, purchasing and inventory, poultry, seafood and meats, marketing and the menu, desserts and baking and global cuisines. 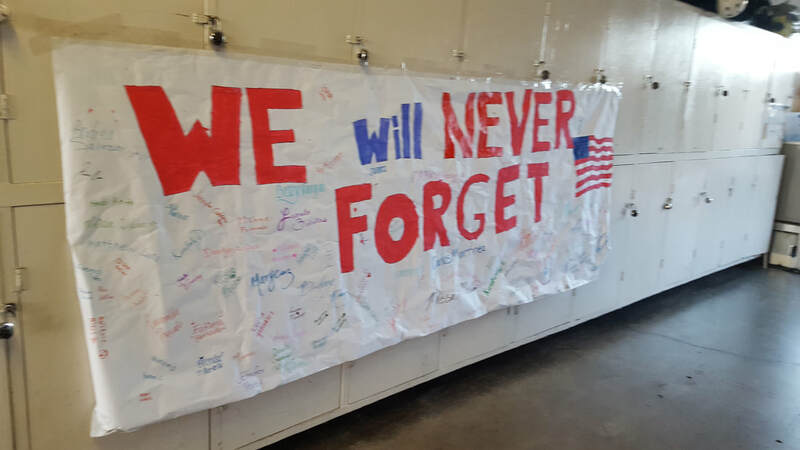 For the 9/11 memorial service, at the Valley Center Fire department, Martie Napier's class made posters for the ceremony, which were displayed inside fire station #1. A first responder student, Rosie, who is in 6th period culinary arts, made cookies to give to the firefighters. They were very thankful. All of the students wrote letters of appreciation for the first responders, which were given to them as well. The students will never forget those who gave the ultimate sacrifice on that day, 16 years ago. Preparing for Scrub club Friday! 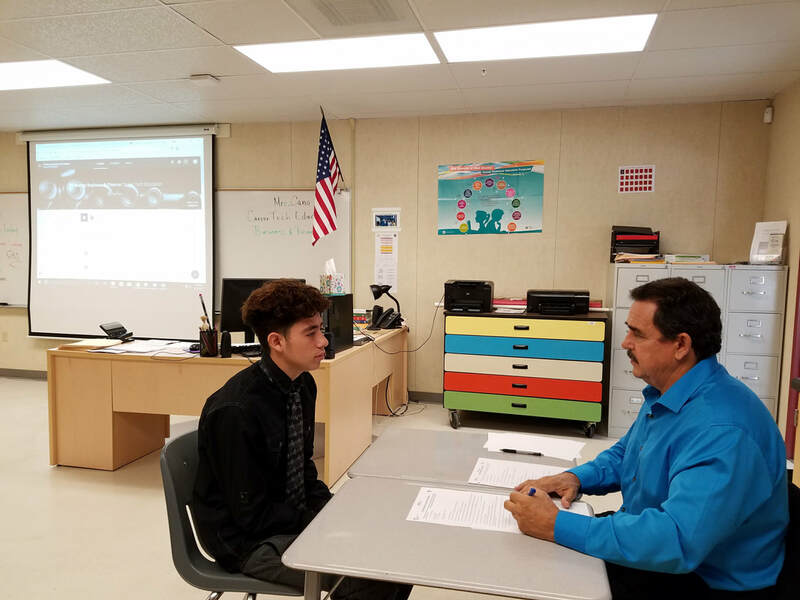 ​Two current and four former Mission Vista High School students were recently invited to host the Genius in the House event at the Reuben H. Fleet Science Center. The event normally invites prominent scientists to come and share their expertise with visitors to the Fleet. MVHS Computer Science teacher, Jeffrey Yee, was thrilled to hear that the students were asked to host the event. The students that participated were Blake V, Joseph M, Thomas W, Chris M, Michael T, and Miguel M. The students presented computer games that they created at this summer's Making Games with Movement Hackathon. 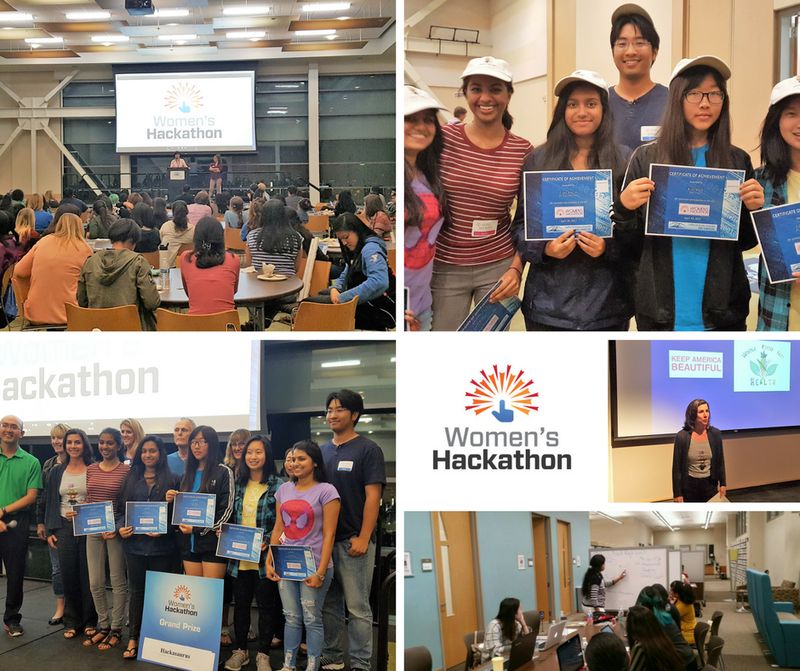 The Making Games with Movement Hackathon was hosted by UCSD and required the teams to create games using non-traditional game controllers like the Tobii Eye Tracker, LEAP Motion Controller, and Kinect for Windows. Miguel and Michael used the LEAP controller to allow the player to use different hand motions to protect helpless creatures from charging animals, Joseph, Blake, and Thomas used the Kinect to track the player's arm and hand movements to cast magical orbs, and Chris and his team used the Tobii eye tracker to enable a game to played with only their eyes. The success of their games was noticed by organizers of the Hackathon and they put the students in contact with executives from the Fleet. The students were asked to present their games to the Fleet staff including the director of exhibits. The Fleet staff was so impressed with the presentation that they immediately asked the students to host the Genius in the House event. The event coincided with the Fleet's major showcase exhibit, Game Masters: The Exhibition. The students did a fantastic job hosting the Genius in the House event. They spent nearly four hours talking with visitors to the Fleet and spoke with well over one-hundred people of all ages. The students let the visitors play their games and the students explained the details of how they created the games. All the visitors were amazed that high school students could create such impressive computer games. ​I am proud to announce that at the April 22nd, 2017 Spring CSUSM Women's Hackathon, the RBV Code Queens (10th graders: Cindy Bui, Lorena Arcos, Liliana Vang &amp; Eve Diaz) won the category for User Experience and Functionality and 3rd Overall out of 17 high school and college teams!!!! 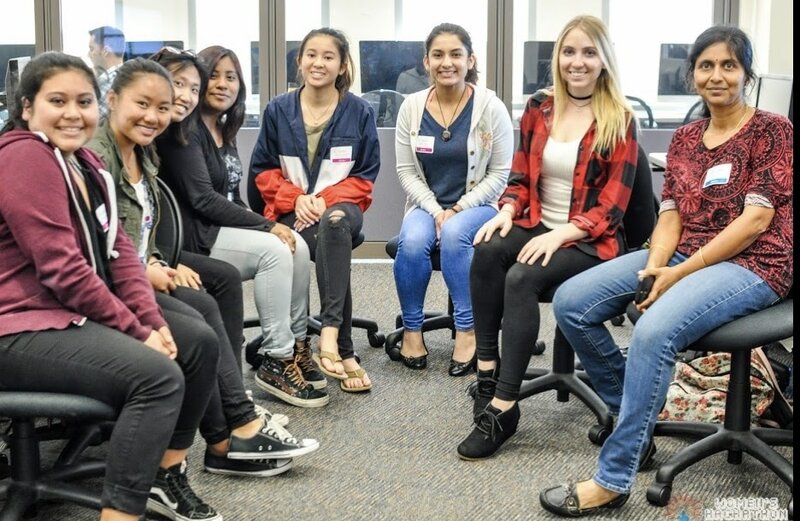 Some of you will remember their mentor, Emily Sorger, RBV grad 2015, current CSUSM computer science student inspiring our girls. 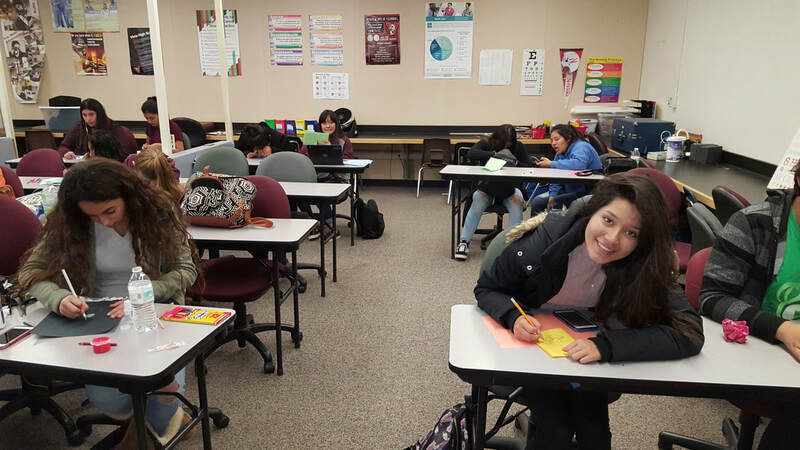 -- Dadre Rudolph On Saturday April 22, 2017, close to 75 southern California female high school and college students formed 17 teams to develop mobile apps and web based solutions to solve one of two civic causes. Guided by professional mentors and judges from the tech community, projects were evaluated and prizes awarded for the following categories. Congratulations to all teams - for your innovation and creativity! 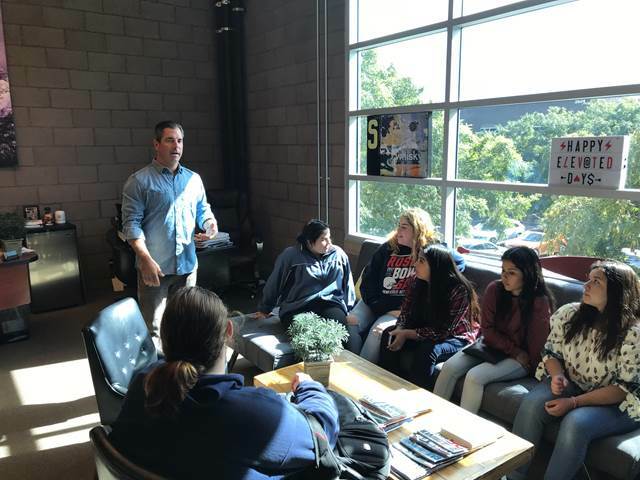 Vista High School's CTE Sports Medicine class was able to take a field trip to Cal State San Marcos, where they were treated to a tour of the athletic facility with Morod Shah, Associate Director of Athletics and Head Athletic Trainer Michelle Hamilton, who is an ex-Vista Athletic Trainer. 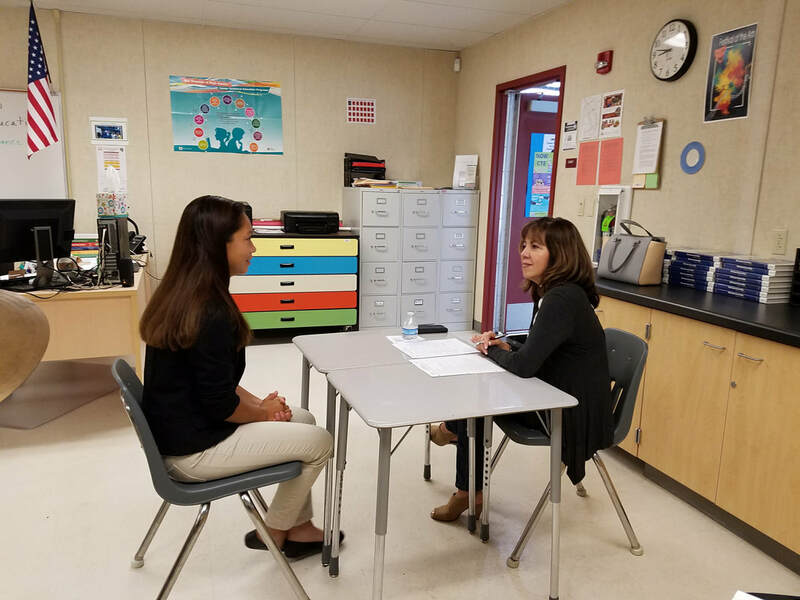 They were able to ask questions about working as an athletic trainer and what they need to do in order to get where she is at today; such as education needed, internships, other jobs, etc. 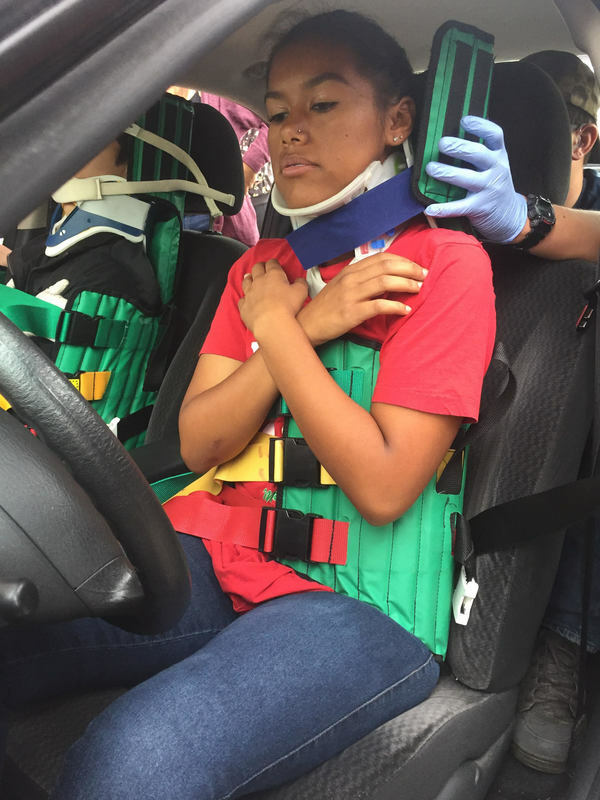 They were able to learn more about specific injuries and emergencies she has had to deal with. 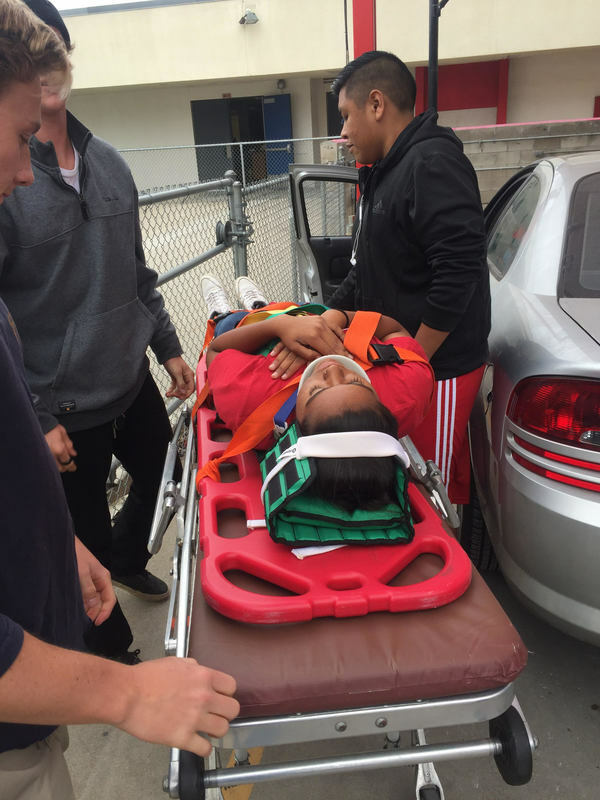 Most importantly, they were able to ask about opportunities that are out there for young students to get a better understanding of how they can decide if a career path in sports medicine is appropriate for them. 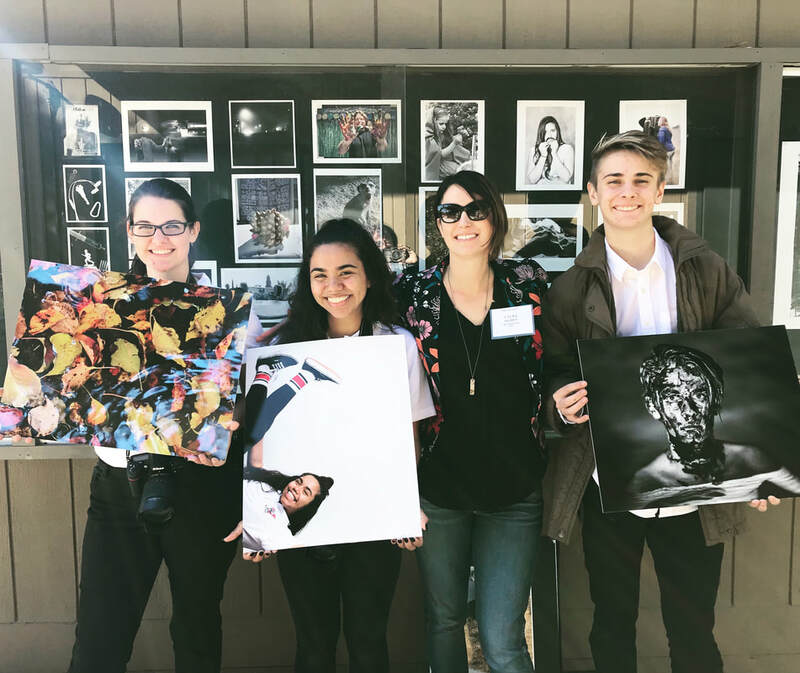 Vista CTE Photography students were the top prize winners at the Carlsbad Oceanside Art League's (COAL) Annual High School Fine Art & Photography Show. The show went from April 3rd through April 17th at the OPT Underground Gallery, located at Oceanside Photo and Telescope in Oceanside. The show featured 275 entries from students from the Army & Navy Academy, El Camino, Carlsbad, Mission Vista, Oceanside, Rancho Buena Vista and Vista. Judged by Lou Kasza and Phyllis Swanson, over $1000 in awards were presented to students at a reception on April 3. Rayanna King of Rancho Buena Vista High School won first place for photography with her "Rainy Day at Rancho" photograph. Her photograph is a moody composition of the school's walkway during the evening, and strikes a melancholic chord to everyone who sees it. Other top prize winners include Rancho's Gerardo Zuniga with a McDowell Memorial Award, Vista High School's Ethan Lewellyn with the Patron Award, Daniel De La Torre with an Honorable Mention, and Mission Vista's student Lauren Spears with an honorable mention. Over thirty Mission Vista High School students participated in the Mission:Code computer programming competition. 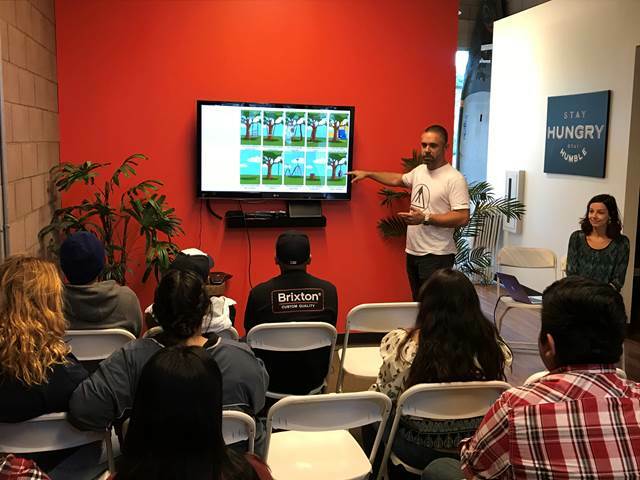 MVHS seniors, Aaroh Mankad, Chris Martin, and Eric Ceballos organized the seven hour event where eleven different teams had the mission of designing and implementing an interactive 2D or 3D game from scratch. 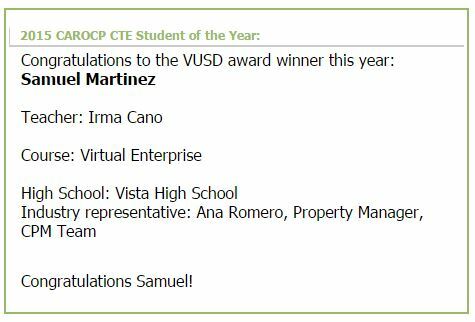 Historically, the San Diego and Imperial Valley chapter of California Regional Association of Centers and Programs (CAROCP) honors outstanding students in CTE/ROP programs in our region. Students, their teacher and an industry representative are recognized in May at SDCOE Student Awards Ceremony. The afternoon begins with a "Taste of CTE" where culinary teams across the county treat honorees and their families to tasty bites from CTE culinary programs. 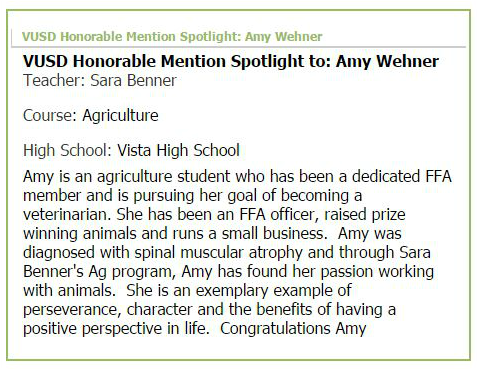 This year, two students from Vista Unified School District CTE were honored. We would like to commend you all for your excellent work and collaboration!